We all know about the big advantages of having a lawn sprinkler system in your yard. It’s a great way to make sure your lawn and garden get the proper amount of water at the best times. And it’s so convenient, especially when a timer is connected to the lawn sprinkler system. The sprinkler system just removes so much of the hassle that can be associated with watering the lawn. Yet some folks may decide to try and hide the sprinkler system and the sprinkler heads from plain view. There are ways to accomplish this but it’s important to go about it the right way. One way to cover the sprinkler heads is by using artificial rock covers. Place an artificial rock cover over each sprinkler head in your yard. Most artificial rock covers are made of plastic and have an exterior that is designed to look like real stone. However, they have hollow interiors, which allow for easy placement and removal. This is convenient and important since the artificial rock covers need to be removed before you turn on the water sprinkler system. If you want a more natural camouflage for an older sprinkler system that is no longer functioning, you can plant bushes around them. 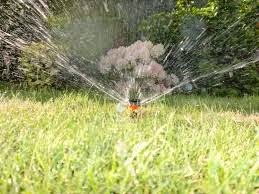 Remember, this is only an option for a sprinkler system that is now longer in use. Position the bushes so that the sprinkler heads are completely concealed. A lawn sprinkler system with retractable heads will also be a little more discreet. When the sprinkler system is not in use, the sprinkler heads retreat into the ground, under a cover. You can also place potted plants over the sprinkler system. Then remove the potted plants from each sprinkler head when it comes time to use the sprinkler system. Make sure you have a clear understanding of what kind of heads your sprinkler system has before trying to hide the sprinkler heads.